It is possible for incorrect assumptions to produce correct results. Just sayin. For Ugo, this goes against his general thesis that we still have time to transition to Renewable Energy before the oil economy sputters to a halt. I imagine the same is true for the other scientists quoted in this article. They are the "anti-catastrophist" wing of the Collapse Party. They know collapse is coming, but they think there is still some fix to it that doesn't involve billions of people dying. Whether you are J6P or a Scientist, the psychology is the same and most people don't want to accept the idea that mass death is coming down the pipe, inevitably. Another Spanish physicist, Carlos de Castro from the University of Valladolid, also published a scathing critique of the Hill’s Group’s report (in Spanish). The physical, technological and economic foundations of the report are erroneous, he says. 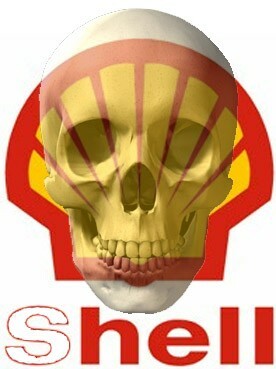 The Hill’s Group in fact focuses on the loss of thermal energy involved in the oil extraction process (oil moving from a high temperature reservoir to ambient temperature outside), which he says has nothing to do with the energy cost of the oil procurement process for human societies. What matters to society, he says, is not oil’s thermal energy but its chemical energy – even if this chemical energy may then be used to generate heat. The ETP model, he concludes, is not an adequate model to assess the net energy derived form petroleum extraction and its evolution. I wouldn't say "The Hill’s Group in fact focuses on ... thermal energy". It includes it, but it also includes the chemical energy. If the details were made public (which they weren't, at least, not in the free report) it would be possible to quantify how much the thermal energy is compared to the chemical energy - I would guess it is fairly small, and wouldn't change the overall result that much. So yes, the thermal energy is irrelevant, and the theory is partly incorrect, and its claimed accuracy is wrong. But without reworking the calculations, de Castro hasn't added much to the argument. ... Bardi says, but the way to study it is based on the ‘life cycle analysis’ (LCA) of the process. I agree, but that doesn't add anything to the argument either. The economy is a complex adaptative system that evolves in ways that cannot be understood in terms of mere energy return considerations. Indeed. The US was exporting fuel by air tanker 7,000 miles to Afghanistan (and still is) by which time it costs $100 per gallon, and is used up in 5 minutes of helicopter flight. No matter, write another UST bond and auction it off, with the Fed supporting the bond price, and it's paid for. It even raises GDP. You can't get much more stupid than that, but it happens. I merged this topic into the Hill's Group main thread. I think BW Hill and company did a lot of data fitting and came into this with a conclusion already in mind. Without seeing how they arrived at everything it's hard to say exactly what they are measuring here, or how they calculated "affordability" for the consumers either. That depends on how the credit is distributed out. However, this doesn't mean it's necessarily wrong, just not mathematically really rigorous. We'll just have to see in 2020 if the oil price really drops down below $12/bbl. If it does, then they clearly got something right. Thank you for saying that. The techniques used by the Hills group seem no more flawed than the techniques used to estimate schedules in the buisness world. With acceptable results. There will be no transition and with Trump in the Oval Office anybody who thinks there will be will also believe in rainbow shitting unicorns and might be in need of medication. Due to the depletion of conventional, and hence cheap, crude oil supplies (i.e. peak oil), increasing the supply of oil in the future would require exploiting lower quality resources (i.e. expensive),and thus will most likely occur only at high prices. This situation creates a system of feedbacks where economic growth, which requires more oil, would require high oil prices that will undermine that economic growth. We conclude that the economic growth of the past 40 years is unlikely to continue unless there is some remarkable change in how we manage our economy. Numerous theories have been posited over the past century that have attempted to explain business cycles, or to generate some means of accelerating a return to rapid growth during slow or non-growth times. Many offer a unique explanation for the causes of and solutions to recessions. They include ideas based on: Keynesian Theory, the Monetarist Model, the Rational Expectations Model, Real Business Cycle Models, Neo- Keynesian models, etc. (Knoop, 2010). Yet, for all the differences amongst these theories, they all share one implicit assumption: that there will be a return to a growing economy, i.e. growing GDP. 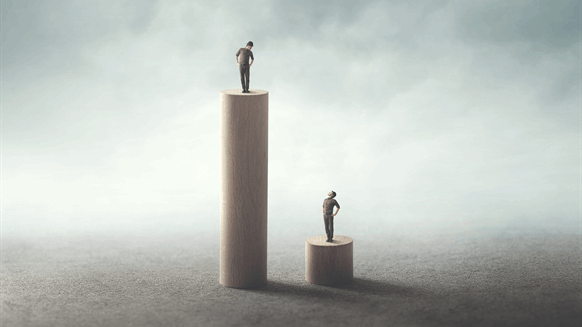 Historically, there has been no reason to question this assumption as GDP, incomes, and most other measures of economic growth have in fact grown steadily over the past century. But if we are entering the era of peak oil, then for the first time in history we may be asked to grow the economy while simultaneously decreasing oil consumption, something that has yet to occur in the U.S. for 100 years. Oil more than any other energy source is vital to today’s economies because of its ubiquitous application as nearly the only transportation fuel, as a portable and flexible carrier and as feedstocks for manufacturing and industrial production. Historically, spikes in the price of oil have been the primary cause of most recessions. On the other hand, expansionary periods tend to be associated with the opposite oil signature: prolonged periods of relatively low oil prices that increase aggregate demand and lower marginal production costs, all leading to, or at least associated with, economic growth. By extension, for the economy to sustain real growth over time there must be an increase in the flow of net energy (and materials) through the economy. Quite simply economic production is a work process and work requires energy. This logic is an extension of the laws of thermodynamics, which state that: (1) energy cannot be created nor destroyed, and (2) energy is degraded during any work process so that the initial inventory of energy can do less work as time passes. As Daly and Farley (2003) describe, the first law places a theoretical limit on the supply of goods and services that the economy can provide, and the second law sets a limit on the practical availability of matter and energy. In other words, the laws of thermodynamics state that to produce goods and services, energy must be used, and once this energy is used it is degraded to a point where it can no longer be reused to power the same process again. Thus to increase production over time, i.e. to grow the economy, we must either increase the energy supply or increase the efficiency with which we use our source energy. This is called the energy-based theory of economic growth, which was advanced significantly by the work of Nicolas Georgescu-Roegen (GeorgescuRoegen, 1971), amongst many others (Costanza, 1980; Cleveland et al., 1984; Ayres, 1999; Hall et al., 2001; Daly and Farley, 2003; Ayres and Ware, 2005; Hall and Day, 2009). This energy-based theory of economic growth is supported by data: the consumption of every major energy source has increased with GDP since the mid-1800s at nearly the rate that the economy has expanded (Fig. 1). Throughout this growth period, however, there have been numerous oscillations between periods of growth and recessions. Fig. 1. Energy production and GDP for the world from 1830 to 2000. Cleveland et al. (2000) analyzed the causal relation between energy consumption and economic growth and their results indicate that, when they adjusted the data for quality and accounted for substitution, energy consumption caused economic growth. Other subsequent analyses that adjusted for energy quality support the hypothesis that energy consumption causes economic growth, not the converse (Stern, 1993, 2000). In sum, our analysis indicates that about 50% of the changes in economic growth over the past 40 years are explained, at least in the statistical sense, by the changes in oil consumption alone. In addition, the work by Cleveland et al. (2000) indicates that changes in oil consumption cause changes in economic growth. These two points support the idea that energy consumption, and oil consumption in particular, is of the utmost importance for economic growth. Yet changes in oil consumption are rarely used by neoclassical economists as a means of explaining economic growth. For example, Knoop (2010) describes the 1973 recession in terms of high oil prices, high unemployment and inflation, yet omits mentioning that oil consumption declined 4% during the first year and 2% during the second year. Later in the same description, Knoop (2010) claims that the emergence from this recession in 1975 was due to a decrease in both the price of oil and inflation, and an increase in money supply. To be sure, these factors contributed to the economic expansion in 1975, but what is omitted, again, is the simple fact that lower oil prices led to increased oil consumption and hence greater physical economic output. Oil is treated by economists as a commodity, but in fact it is a more fundamental factor of production than either capital or labor (Hall et al., 2001). Thus we present the hypothesis that higher oil prices and lower oil consumption are both precursors to, and indicative of, recessions. Likewise, economic growth requires lower oil prices and simultaneously an increasing oil supply. The data support these hypotheses: the inflation-adjusted price of oil averaged across all expansionary years from 1970 to 2008 was $37 per barrel compared to $58 per barrel averaged across recessionary years, whereas oil consumption grew by 2% on average per year during expansionary years compared to decreasing by 3% per year during recessionary years (Figs. 2 and 4). Although this analysis of recessions and expansions may seem like simple economics, i.e. high prices lead to low demand and low prices lead to high demand, the exact mechanism connecting energy, economic growth, and business cycles is rather more complicated. Hall et al. (2009) and Murphy and Hall (2010) report that when energy prices increase, expenditures are re-allocated from areas that had previously added to GDP, mainly discretionary consumption, towards simply paying for the more expensive energy. In this way, higher energy prices lead to recessions by diverting money from the economy towards energy only. The data show that recessions occur when petroleum expenditures as a percent of GDP climb above a threshold of roughly 5.5% (Fig 5). [Every] time the U.S. economy emerged from a recession over the past 40 years, there was always an increase in the use of oil while a low oil price was maintained. In light of these two realities, the following two questions become particularly germane: What are the implications for economic growth if (1) oil supplies are unable to increase with demand, or (2) oil supplies increase, but at an increased price? There is a clear trend in the literature on energy return on (energy) invested (EROI) of global oil production towards lower EROIs. Gagnon et al. (2009) report that the EROI for global oil extraction declined from about 36:1 in the 1990s to18:1 in 2006. This downward trend results from at least two factors: first, increasingly supplies of oil are originating from sources that are inherently more energy-intensive to produce simply because firms have developed cheaper resources before expensive ones. For example, in the early 1990s fewer than 10% of oil discoveries were located in deep water areas. By 2005 the number jumped to greater than 50%. Enhanced oil recovery techniques are being implemented increasingly in the world’s largest conventional oil fields. For example, nitrogen injection was initiated in the once supergiant Cantarell field in Mexico in 2000, which boosted production for four years, but since 2004 production from the field has declined precipitously. Although enhanced oil recovery techniques increase production in the short term, they also increase significantly the energy inputs to production, offsetting much of the energy gain for society. Roughly 60% of the oil discoveries in 2005 were in deep water locations (Fig. 6). Based on estimates from Cambridge Energy Research Associates (CERA, 2008), the cost of developing that oil is between $60 and $85 per barrel, depending on the specific deep water province. Oil prices therefore, at a minimum, must exceed roughly $60 per barrel to support the development of even the best deep water resources. But the average price of oil during recessionary periods has been $57/bbl, so it seems that increasing oil production in the future will require oil prices that are associated with recessionary periods. All of this data indicates that an expensive oil future is necessary if we are to expand our total use of oil. In other words, growing the economy will require oil prices that will discourage that very growth. Indeed, it may be difficult to produce the remaining oil resources at prices the economy can afford, and, as a consequence, the economic growth witnessed by the U.S. and globe over the past 40 years may be a thing of the past. The production costs for oil sands are roughly $85 per barrel compared to roughly $40 for average global oil and perhaps $20 (or less) per barrel for Saudi Arabian conventional crude (CERA, 2008). As we can see from this data there is an inverse relation between EROI and price, indicating that low EROI resources are generally more expensive to develop whereas high EROI resources are on average relatively inexpensive to develop (Fig. 7). As oil production continues, we can expect to move further towards the upper right of Fig. 7. In summary, relatively low EROI appears to translate directly into higher oil prices. It is important to emphasize that these models assume that society will continue to pursue business-as-usual economic growth, i.e. the models assume that business persons will continue to assume that oil demand will continue to increase indefinitely in the future (whether or not they understand the role of the oil). For the economy of the U.S. and any other growth-based economy, the prospects for future, oil-based economic growth are bleak. Taken together, it seems clear that the economic growth of the past 40 years will not continue for the next 40 years. Over the past 40 years, economic growth has required increasing oil consumption. The supply of high EROI oil cannot increase much beyond current levels for a prolonged period of time. The average global EROI of oil production will almost certainly continue to decline as we search for new sources of oil in the only places we have left: deep water, arctic and other hostile environments. Increasing oil supply in the future will require a higher oil price because mostly only low EROI, high cost resources remain to be discovered or exploited, but these higher costs are likely to cause economic contraction. Using oil-based economic growth as a solution to recessions is untenable in the long-term, as both the gross and net supplies of oil has or will begin, at some point, an irreversible decline. Due to the depletion of high EROI oil the economic model for the peak era, i.e. roughly 1970-2020, is much different from the pre-peak model, and can be described by the following feedbacks ( Fig. 8): (1) economic growth increases oil demand, (2) higher oil demand increases oil production from lower EROI resources, (3) increasing extraction costs leads to higher oil prices, (4) higher oil prices stall economic growth or cause economic contractions, (5) economic contraction leads to lower oil demand, and (6) lower oil demand leads to lower oil prices which spur another short bout of economic growth until this cycle repeats itself. This system of insidious feedbacks is aptly described as a growth paradox: maintaining business as usual economic growth will require the production of new sources of oil, yet the only sources of oil remaining require high oil prices, thus hampering economic growth. This growth paradox leads to a highly volatile economy that oscillates frequently between expansion and contraction periods, and as a result, there may be numerous peaks in oil production. Campbell (2009) has referred to this as an undulating plateau. In terms of business cycles, the main difference between the pre and peak era models is that business cycles appear as oscillations around an increasing trend in the pre-peak model while during the peak-era model they appear as oscillations around a flat trend. It is important to emphasize that these models assume that society will continue to pursue business-as-usual economic growth, i.e. the models assume that businesspersons will continue to assume that oil demand will continue to increase indefinitely in the future (whether or not they understand the role of the oil). But what if economic growth was no longer the goal? What if society began to emphasize energy conservation over energy consumption? Unlike oil supply, oil demand is not governed by depletion, and incentivizing populations to make incremental changes that decrease oil consumption can completely alter the relation between oil and the economy that was described in the aforementioned model. Decreasing oil consumption in the U.S. by even 10% would release millions of barrels of oil onto the global oil markets each day. For the economy of the U.S. and any other growth-based economy, the prospects for future, oil-based economic growth are bleak. Taken together, it seems clear that the economic growth of the past 40 years will not continue for the next 40 years unless there is some remarkable change in how we manage our economy. Ayres, R., Ware, B., 2005. Accounting for growth: the role of physical work. Structural Change and Economic Dynamics 16, 181–209. Ayres, R.U., 1999. The second law, the fourth law, recycling and limits to growth. Ecological Economics 29, 473–483. Campbell, C., 2009. Why dawn may be breaking for the second half of the age of oil. First Break 27, 53–62. CERA, 2008. Ratcheting Down: Oil and the Global Credit Crisis. Cambridge Energy Research Associates. Cleveland, C.J., Costanza, R., Hall, C.A.S., Kauffmann, R., 1984. Energy and the U.S. economy: a biophysical perspective. Science 225, 890–897. Cleveland, C.J., Kaufmann, R.K., Stern, D.I., 2000. Aggregation and the role of energy in the economy. Ecological Economics 32, 301–317. Costanza, R., 1980. Embodied energy and economic valuation. Science 210, 1219–1224. Daly, H.E., Farley, J., 2003. Ecological Economics: Principles and Applications. Island Press. Faber, M., Manstetten, R., Proops, J., 1996. Ecological Economics: Concepts and Methods. Edward Elgar, Cheltenham. Federal, R., 2009. St. Louis Federal Reserve. Gagnon, N., Hall, C.A.S., Brinker, L., 2009. A preliminary investigation of the energy return on energy invested for global oil and gas extraction. Energies 2, 490–503. Georgescu-Roegen, N., 1971. The Entropy Law and the Economic Process. Harvard University Press, Cambridge. Hall, C.A., Balogh, S., Murphy, D.J., 2009. What is the minimum EROI that a sustainable society must have? Energies 2, 1–25. Hall, C.A.S., Day, J.W., 2009. Revisiting the limits to growth after peak oil. American Scientist 97, 230–237. Hall, C.A.S., Lindenberger, D., Kummel, R., Kroeger, T., Eichhorn, W., 2001. The need to reintegrate the natural sciences with economics. Bioscience 51, 663–673. Hayward, T., 2010. BP Statistical Review of World Energy. Report, British Petroleum. Jackson, P.M., 2009. The Future of Global Oil Supply. Energy Research Associates, Cambridge. Knoop, T.A., 2010. Recessions and Depressions: Understanding Business Cycles. Praeger, Santa Barbara. Murphy, D.J., Hall, C.A.S., 2010. Year in review – EROI or energy return on (energy) invested. New York Annals of Science 1185, 102–118. NBER, 2010. US Business Cycle Expansions and Contractions. National Bureau of Economic Research. Smil, V., 2010. Energy Transitions: History, Requirements, Prospects. Praeger, Santa Barbara, CA. Stern, D.I., 2000. A multivariate cointegration analysis of the role of energy in the US macroeconomy. Energy Economics 22, 267–283. Venezuela might have to declare force majeure on its oil exports as production plunges and its ports are unable to ship enough crude. The ongoing meltdown in Venezuela’s oil sector could tighten the oil market more than expected. Reuters reported Tuesday that Venezuela is considering declaring force majeure, a legal declaration made in extraordinary circumstances to basically get out of contractual obligations. In other words, Venezuela’s PDVSA is essentially prepared to say that it can’t supply the oil that it promised. The utter collapse of the country’s oil production is obviously a big factor in PDVSA’s inability to ship enough oil. Output is down below 1.5 million barrels per day and falling fast. But the tanker traffic at a handful of its ports has created unexpected bottlenecks, which have slowed loadings. Clogged ports are the direct result of the seizure of operations on several Caribbean islands by ConocoPhillips last month. The American oil major sought to enforce an arbitration award, laying claim to a series of storage facilities on the islands of Bonaire, Curacao and Aruba. Those assets were crucial to PDVSA’s operations – in fact, they had become even more important as PDVSA’s facilities in Venezuela deteriorated. They had the ability to service very large crude carriers (VLCCs), and were important for storing and blending PDVSA’s oil, and preparing it for export. Since ConocoPhillips tried to take over those facilities, PDVSA has tried to shift operations back to its ports in Venezuela. But those terminals are in very bad shape, and cannot make up for the loss of the Caribbean facilities. Reuters reported that there are more than 70 tankers sitting off the Venezuelan coast. Related: Will Saudi Arabia Listen To U.S. Demands For More Oil? Reuters also says that PDVSA told customers that they need to send ships that are able to handle ship-to-ship loadings, since they can’t service enough ships at the ports. If customers fail to do that, or fail to accept those terms, PDVSA could declare force majeure. Reuters says most customers are balking at the demand since there is no third party supervision, plus the added cost of ship-to-ship transfers is also something customers are not willing to take on. It is no surprise that Venezuela has fallen short on the shipments it has promised, but the figures are staggering. In April, Venezuela only shipped 1.49 million barrels per day of oil and fuels, or 665,000 bpd below what it had contracted, according to Reuters. That means that some customers are missing out on cargo. For instance, in April, PDVSA shorted its subsidiary Citgo nearly all of what it had promised – 273,000 bpd. The problems for Venezuela continue to mount, and the news that it is considering force majeure points to a more catastrophic decline in production and exports. PDVSA "in the best case only has about 695,000 b/d of crude supply available for export in June," a marketing division executive within the company told Argus Media. It seems unlikely that the sudden decline in exports will be resolved in any reasonable timeframe. It isn’t just a matter of easing bottlenecks at the ports. For one, it isn’t clear that PDVSA can handle the necessary volumes from its existing export terminals. More importantly, upstream oil production continues to plummet, and refining and processing are also in freefall. Venezuela’s heavy oil needs to be upgraded before it can be exported, but at least three PDVSA upgraders are in terrible shape, and the Petropiar upgrader, which PDVSA runs jointly with Chevron, is offline for maintenance. That is also the site overseen by Chevron employees that were detained by Venezuelan security services a few months ago, putting a chill on operations. As a result, the force majeure on shipments seems unavoidable, unless that is, customers simply take a haircut and accept lower volumes. A PDVSA source told Argus Media that companies that don’t accept lower volumes could see all of their shipments suspended. That sounds like a threat, but it is PDVSA that is in the state of crisis, not buyers from China, India or the U.S.
Customers are already reporting problems with shipments. A Japanese trading house told S&P Global Platts this week that it has been unable to load up on Venezuelan oil under a loan-for-oil deal. "There is no cargo made available to lift," said the source. Several diplomats from China and India told Argus that refiners from their countries are looking elsewhere for oil shipments in the months ahead, on the expectation that cargoes from Venezuela continue to decline. Independent refiners from China are looking at heavy crude sources such as Mexico’s Maya, Colombia’s Castilla, and Canada’s Cold Lake Blend, according to S&P Global Platts. PDVSA could cite U.S. sanctions as a justification for force majeure, and while that could potentially provide some legal basis for nixing shipments, from the oil market perspective, it makes no difference one way or another why exports are declining, or who is at fault. All that matters is that supply is falling fast, and to the extent that PDVSA can’t keep up with its obligations, it is a worrying sign that even the most pessimistic scenarios for Venezuelan output could turn out to be too hopeful. Hi Buddy J, Pleasure to finally converse with you. Yes indeed, especially when one considers the leverage employed by these outfits. Most have very heavy debt laden balance sheets and the would undergo a veritable explosion in their earnings with such lofty prices. Wall St however is a two way street and there is always the question of their long term viability and ever increasing environmental concerns. As always Buddy, "Caveat Emptor"
Mexico still has Oil to sell? Mexico will likely halt oil auctions for at least two years, dealing a blow to its oil industry. Mexico’s president-elect Andres Manuel Lopez Obrador (AMLO) will reportedly suspend oil auctions for at least two years, according to the Wall Street Journal, with some experts believing that his administration won’t hold any new oil auctions at all during his six-year term. He has also vowed to review the 107 contracts already awarded to companies through auctions over the last few years to check for corruption, although he has said he would not try to invalidate them so long as they check out. Also, AMLO wants to revise some of the energy laws that govern the oil and gas sector, which could dramatically alter the landscape for foreign oil and gas companies. He long opposed the historic reforms that ended seven decades of state control over the energy sector, although he moderated his position during this year’s presidential campaign. Rolling back the reforms would be exceedingly difficult, requiring a change to the country’s constitution. Instead, AMLO wants more modest, though still significant, legislative changes. The WSJ reports that he will pursue legislative tweaks that bolster the power of state-owned Pemex, while weakening the regulatory body that has pursued a technocratic approach and presided over the oil auctions over the last three years. AMLO’s desired changes include allowing Pemex to choose its own private-sector partners, without needing the approval from regulators. Current rules require Pemex to partner with the highest bidder for blocks put up for a farm-out. He wants the government to be able to award Pemex with oil blocks directly. And he wants to make Pemex the sole marketer of oil produced by private firms, the WSJ reports. On top of that, the WSJ says AMLO will push to raise local content rules, which would require a higher percentage of domestic involvement in oil projects. That means that if a company like ExxonMobil or Chevron or some other outside entity wants to drill for oil in Mexico, it would need to source a certain percentage of equipment and services from within Mexico. The idea is to capture a greater portion of the benefits of oil and gas development for the country, while also building up expertise for local industries. However, many of these changes will be loathsome to the international oil companies, who will view them as onerous burdens that inject higher levels of uncertainty into their investments. Oil companies have repeatedly blamed strict local content rules in Brazil for years of cost inflation and delays. “If all of this is confirmed, it would send a signal that the continuity of the oil opening may be in doubt,” Pablo Medina, an analyst with Welligence Energy Analytics, a research firm based in Houston, told the WSJ in an interview. Related: What Caused Oil’s Longest Losing Streak In Years? Meanwhile, in addition to the legislative changes to the energy reforms, AMLO’s core energy plan consists of pouring billions of dollars back into Pemex for oil exploration, with a particular focus on revitalizing the downstream sector. He wants $2.6 billion to rehabilitate Mexico’s six aging oil refineries, plus more than $8 billion to build a new refinery from scratch. The idea is to cut down or even eliminate gasoline imports from the United States. Mexico’s oil production has been declining for over a decade, falling to 1.9 million barrels per day recently, down from 3.4 mb/d in the mid-2000s. The IEA sees output falling by another 130,000 bpd this year, due to the aging offshore oil fields, although that is a narrower decline compared to the 235,000 bpd the country lost last year. AMLO is aiming to boost production by 600,000 bpd over the next two years, which will be a monumental task. If he is to succeed, AMLO is betting that Pemex will lead the way. Trump’s trade war is taking a toll on the oil and gas industry. There has been some eleventh-hour drama over the renegotiation of NAFTA, but the energy industry is likely going to dodge a bullet on that front, with the most contentious issues revolving around agriculture and automobiles. But even if the NAFTA renegotiation succeeds, the oil and gas industry has already taken a hit from Trump’s broader trade war. The most obvious impact comes from the 25 percent steel and 10 percent aluminum tariffs that the Trump administration has placed on a variety of countries, which have pushed up the cost of steel in the U.S., leading to cost inflation for oil and gas projects. Worse, the application system for waivers is cumbersome and time-consuming, and some companies are angry because precisely who obtains an exemption from the federal government seems to be arbitrary. For instance, as Reuters reported, Chevron received a waiver for importing a 4.5-inch steel pipe used for oil exploration while a small company called Borusan Mannesmann Pipe saw its application rejected by the U.S. Commerce Department for a similar steel pipe used in well casing. The Commerce Department has been accused of not providing adequate information on why it rejects certain cases, offering only vague language such as the availability of domestic steel. 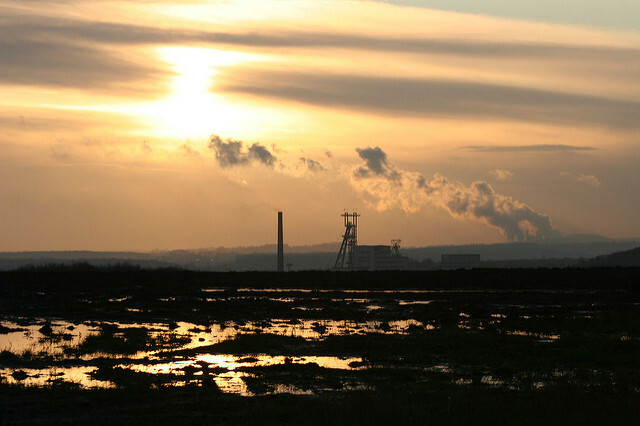 A common thread in the rejections seems to be opposition submitted from steel producers. Reuters says that Commerce has received over 37,000 applications for waivers from U.S. companies, but the agency has only issued decisions on 2,871 of those requests as of August 20. Roughly two-thirds of the applications were approved, but nearly 1,100 were rejected. “The Commerce Department is now hard-pressed to spend more than a few minutes reviewing each application,” said Bernd Janzen, a partner in Akin Gump Strauss Hauer & Feld LLP, told Reuters. In the case of Borusan, which saw its application rejected, the company expects its operating costs to rise from $25 to $35 million because of the tariffs. A few weeks ago, Plains All American also was rebuffed by Commerce for imported steel for its Cactus oil pipeline in Texas. The CEO of Plains called the tariffs a “$40 million tax.” The Cactus pipeline is seen as particularly important because it will help relieve the midstream bottleneck in the Permian when it comes online. Needless to say, steel and aluminum are crucial materials to oil and gas projects, and while the Trump administration is aiming to revive domestic manufacturing, users of those components will pay the price. The costs will reverberate throughout the energy industry, from upstream producers, to oilfield services, refiners, LNG exporters and the endless array of related suppliers and servicers. Still, things could soon get much worse. The Trump administration is reportedly on the verge of moving ahead with the proposed $200 billion in tariffs on Chinese goods, according to Bloomberg. The proposed duties have to go through a public comment period, but that period ends on September 6, clearing the way for Trump to proceed. The personnel making up the Trump administration are often described as being divided into two camps, those in favor of free trade and those that are more nationalistic, spoiling for a trade fight with China. The latter group, seems to have had the upper hand as of late. “The hawks are certainly in the ascendancy on China trade policy,” Amy Celico, Principal of Albright Stonebridge Group said on Bloomberg TV. That does not bode well for a resolution to the trade fight. China has signaled that it won’t back down and will try to match U.S. tariffs with levies of their own. Up until now, China has refrained from slapping tariffs on U.S. crude oil and LNG exports, but there is a good chance that the next phase will ensnare oil and gas. At that point, the trade war could start to affect global growth. “The scale is enormous and once the tariffs materialize, they will definitely send jitters through financial markets,” Gai Xinzhe, an analyst at the Bank of China’s Institute of International Finance in Beijing, told Bloomberg. Implementation of the $200 billion in tariffs is not a foregone conclusion. The Trump administration could impose tariffs in increments, delay them or hold off altogether. But should Trump choose to take the trade fight to the next level, he will be doing so at a time when emerging markets are rattled by currency turmoil, global growth looks shaky, and a growing number of economists see rising potential for a recession in the U.S. over the next two years. This point up the whole problem with Trumponomics. It's just a poorly thought out style of "breaking a few eggs to make an omelet" approach to the subject, and not some clearly stated plan with clear objectives. Trump's objective is always to "stick it to those foreigners who keep taking advantage of America". Which might be fine, except that's not the real problem, but more of a distorted erroneous view of what's going on. You can't just shoot from the hip at the same people who've been negotiating with us in good faith for years and years, and expect things to magically improve. Instead, you burn bridges, piss important allies off, and shoot yourself in the foot. President Andrzej Duda’s authoritarian government can expect a rough political ride in December, when politicians, diplomats and campaigners stream into Katowice, Poland, for the next UN summit on climate change. Poland’s so-called climate policy – to aim for “carbon neutrality” by discounting emissions from the coal industry with carbon sucked up by its forests – will face richly-deserved criticism. How loudly that will be heard on the streets is a different matter: Poland’s parliament has banned “spontaneous” gatherings in Katowice during the summit. Donald Trump, who last year withdrew the US from the 2015 Paris agreement to reduce greenhouse gas emissions, will also be the target of derision, not only from demonstrators but from some politicians inside the talks. The main business at Katowice (the 24th conference of parties to the 1992 Rio climate convention, or COP24) will be to finalise a “rulebook” to monitor government promises to cut greenhouse gas emissions (“nationally determined contributions” or NDCs) made in Paris. The Paris agreement acknowledged that global temperatures should be kept “well below” 2 degrees higher than pre-industrial levels, and that 1.5 degrees is preferable. Campaigners use every phrase in the document to challenge pro-fossil-fuel policies; to resist attempts to make the global south pay the price for warming; and to promote “just transition” that combines the move from fossil fuels with struggles for social justice. While fighting all these battles, it’s important not to neglect the larger picture. The Paris agreement is most significant not as a beacon around which the world can gather to stop climate change, but as the outcome of a disastrous process of failure to reverse the growth of fossil fuel consumption, the main cause of warming. At Paris, the idea of binding targets for greenhouse gas emissions reductions was finally abandoned, in favour of voluntary commitments. While diplomats laud these commitments, the reality is downplayed: even if governments implement their promises, global average temperature is projected to reach 2.7 degrees above pre-industrial levels by 2100, rather than 2 degrees or 1.5 degrees. Historical perspective is useful. Thirty years ago, in June 1988, climate scientists collectively warned that the atmosphere was warming and that greenhouse gases were the main cause. They gathered with diplomats in Toronto, Canada, to form the Intergovernmental Panel on Climate Change (IPCC), a UN body. A year earlier, in 1987, international action had been coordinated, through the Montreal protocol, to curtail the production of chlorofluorocarbons that was opening a dangerous hole in the protective layer of ozone around the earth. The Toronto conference, optimistically, urged similar coordination to cut greenhouse gas emissions by 20% by 2005. The resistance proved greater. At the Rio summit in 1992, the US insisted that there would be no binding targets for reducing emissions. Its diplomats, and even some northern NGOs, focused on deforestation, a minor contributor to global warming, to avoid talking about the major issue: fossil fuel use. To deal with that, market mechanisms could and must be used, they argued. That thinking guided the 1997 Kyoto agreement, which provided for an emissions trading systems that failed miserably to stop oil, gas and coal use galloping upwards. The 2009 Copenhagen conference failed to produce a post-Kyoto deal; Paris, with its voluntary targets, followed. While market mechanisms were prescribed for cutting fossil fuel use, governments oversaw subsidies to fossil fuel production and consumption, running to hundreds of billions of dollars per year. Global total emissions from burning fossil fuels, compared to the 1988 level, not only did not fall by 20% by 2005, as envisaged in Toronto; they grew by 35%. In 2017, they were 60% above the 1988 level. Why has the Rio process failed so disastrously, where the Montreal protocol succeeded? Certainly, politics matters. The 1992 climate change convention was signed as neoliberalism was sweeping through the most powerful countries. While the US Republicans, and major oil producers such as Saudi Arabia and Russia, resisted binding emissions targets, US Democrats and European governments prevaricated. They denounced climate science denial and acknowledged the global warming threat – but nevertheless saw the market as the lever to deal with it. In 1997, Democrats and Republicans united behind a US Senate bill to kill off the principle of binding targets; it passed by 95-0. Future historians will surely look back at the Rio process as a historic collective failure by the world’s leading states, on the scale of the slide to war in 1914. There are no easy responses to this failure. But answers must be sought outside the confines of the Rio process. It is not our framework; let’s not normalise it. The underlying reasons for the states’ failure are of course deeper than politics. The CFCs regulated by the Montreal protocol were a marginal technology, which used to be used in fridge manufacture. But there is nothing marginal about fossil fuels. They are consumed by many of the largest technological systems – car-based transport systems, and urban infrastructure that supports them; electricity networks; industrial systems reliant on carbon-heavy materials like steel; agricultural methods that soak up gas-based fertilisers – embedded in the social and economic systems in which we live. While writing a book on the global history of fossil fuel use, just published, I worked to understand that technology-society nexus. The fossil-fuel based technological systems have been integral to capitalism, and to the labour process it controls; capital’s expansion has driven those systems’ expansion; a technological transition away from fossil fuels will most effectively be accomplished as part of a transition away from capitalism. These profound changes are never going to be undertaken by governments. Public discussion about reducing consumption of fossil fuels, or fuel-intensive products, all too often focus on individual households. This is misleading for three reasons. Firstly, household fuel consumption is riven by inequality. Many households in the global north consume dozens, even hundreds, of times more than those in the global south. More than a billion people, mostly in the countryside in the global south, still don’t have access to electricity. Secondly, even those households that live within the dominant fossil-fuel-supplied energy system, with reasonably regular electricity, winter heat, motorised transport and so on – about 60% of the world population – do not control the supply of fuels. They can not easily opt for measures that could slash their fuel consumption, such as insulating housing, or providing decent public transport to reduce car use. Individuals have still less control over their indirect fuel consumption, e.g. of coal to make steel, or oil to make plastic, in the products they buy; oil used in supply chains; or gas used to make fertiliser to produce food. Thirdly, the way those technological systems use fuels and fuel-intensive materials is historically formed. There is nothing inevitable, or efficient, about the wasteful use of plastic packaging; about city transport systems based on heavy, fuel-intensive, usually single-passenger cars; about fertiliser-heavy industrial agriculture; or even about centralised electricity networks. These technologies are used in the way they are, thanks to the social and economic systems in which they are embedded. Capitalism doesn’t just exploit technology; it shapes it. The transition away from fossil fuels will be a transition away from capitalism towards a society that lives in harmony with nature, fashioning from it what it needs, not what feeds profit. Politically, that has to be fought for outside the UN process. This should be as successful as the war on drugs. Mexico’s new government has launched a multi-pronged offensive against the rampant oil theft that is costing state-owned oil company Petroleos Mexicanos (Pemex) billions of dollars a year and destabilizing entire swaths of the country. Upon its orders, around 4,000 federal police agents, soldiers, and marines will be posted to protect 58 Pemex facilities, six refineries, 39 supply terminals, and 12 pumping stations. The government will also launch an investigation of civil servants and managers of Pemex’s logistics division suspected of involvement in the oil theft. President Andres Manual Lopez Obrador (AMLO for short) told a news conference his government would combat the theft “outside and inside” Pemex, saying authorities were also complicit in many of the crimes (as we have previously reported). Three officials at Pemex have already been arrested for facilitating the oil theft. All three have been sacked and will be facing criminal charges, Mexico’s Attorney General Alejandro Gertz Manero said. These are drastic measures for a drastic situation that keeps getting worse. In 2016, about 26,000 barrels of gasoline were stolen per day in Mexico, according to the CEO of Pemex. By 2018, the daily average theft had jumped to 58,000 barrels. An average of 600 illegal pipeline taps were discovered daily in 2018. As the problem grew, Pemex did something nobody could have predicted: it slashed its spending on security. According to the newspaper El Universal, the company’s total outlay on security shrank from 1.66 billion pesos in 2014 to 539 million pesos in 2017. During the same period the number of people employed and trained by Pemex to detect and counteract oil theft fell by 90%, from 1,248 to 117. In the meantime, the gangs of oil thieves, or huachicoleros, have been diversifying their activities, having discovered a lucrative new niche to exploit: the theft of liquefied petroleum gas (LPG, such as propane or butane). This niche is generating estimated monthly losses of 1.1 billion pesos ($58 million) for LPG producers as well as prompting gas companies to stop distributing along certain routes. For Pemex, the financial fallout keeps growing. Oil theft set the company back 30.9 billion pesos in 2016 ($1.67 billion at the prevailing exchange rate on Dec 31 of that year), 50.1 billion pesos in 2017 ($2.55 billion) and $66.3 billion in 2018 ($3.37 billion), working out at a grand total of $7.6 billion. That’s a lot of money for any company to lose over a three-year period, particularly one that is already buckling under the combined weight of shrinking output, rising losses, and growing debt. Over the past decade, Pemex’s crude oil production has been declining at a rate of around 5% a year, dragging Mexico’s share of global output down from 5% to 2%. 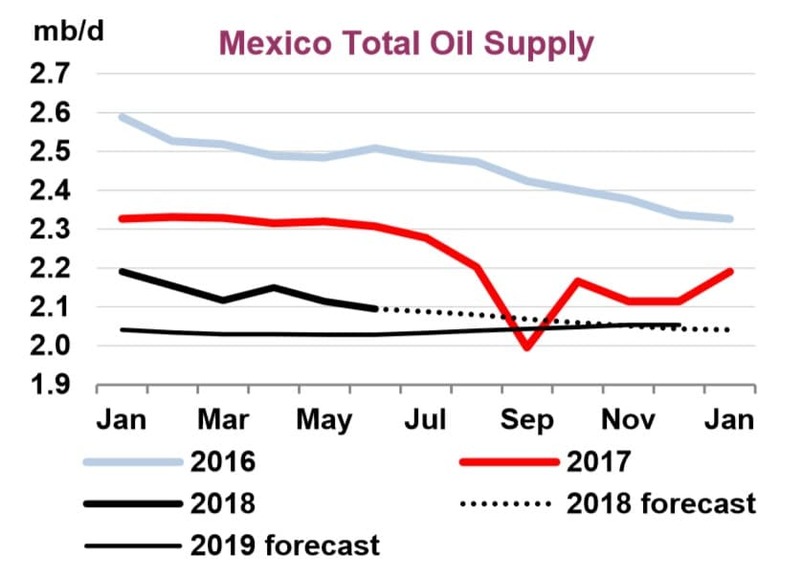 Today, four years after the passage of former President Enrique Peña Nieto’s sweeping energy reforms, Mexico’s oil output languishes at a historic low of 1.77 million barrels per day (b/d), down 8% compared to the same month last year and well below the 3 million b/d that Peña Nieto promised back in 2015. AMLO, like Peña Nieto before him, is determined to reverse this trend, setting a production target of 2.6 million b/d by the end of his administration in 2024. Whereas his predecessor sought to achieve it through deregulating and opening up the market to outside investment and expertise, AMLO sees the answer in revamping Pemex’s creaking refineries so that the company can refine its own crude for the internal market rather than export it to the U.S. only to import it back as finished gasoline. It’s a costly plan, with an estimated $8 billion needed just to build the new oil refinery AMLO has promised for his home state of Tabasco. To that end, the government has increased Pemex’s budget for 2019 by 19% to over $23 billion. It has also suspended auction bid rounds for deepwater and onshore shale oil and gas projects for three years. Neither of these policies have pleased U.S. rating agencies. Both Moody’s and Fitch have raised alarm bells about Pemex’s $106 billion of debt — the biggest of any global energy company — and have threatened to downgrade Pemex’s credit rating to junk if AMLO proceeds with his plans. If they carry through on that threat, investors, including many pension funds and sovereign wealth funds which are contractually bound to hold assets of investment grade quality, may have to dump Pemex debt, with potentially problematic consequences for the finances of both Pemex and Mexico. Nonetheless, in the current standoff AMLO shows little sign of backing down from his stated mission to rebuild Mexico’s oil industry, revitalize Pemex, and develop a more nationalistic approach to energy policy. Indeed, by pledging to crack down on Mexico’s legions of petro-plunderers, he has reaffirmed his commitment to re-energize Mexico’s oil industry. By Don Quijones.